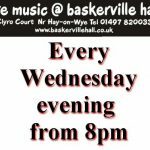 Baskerville Hall Hotel, Clyro Court – will host the annual Black Mountain Bluegrass Picking Weekend again on the weekend of 28th & 29th June 2019. We will have 2 bars with great Wye Valley Ales, loads of picking areas, inside and out. We have a large camping field and some hard standing for bigger motorhomes, camping £6 per person per night. There is also hotel and bunkhouse accommodation available – phone the venue on 01497 820033 to book either, mentioning the magic word “BLUEGRASS” otherwise you will be told that all places are full. Fine weather has been ordered and we hope to see you there! My wife & I spent the weekend with our caravan at the stunning Baskerville Hall Hotel enjoying Bluegrass Music alongwith the great facilities such as the indoor heated swimming pool. Outside, the large gardens gave everyone the space to relax in the sunshine, or go for a walk in the woods. The town of Hay on Wye is not far away and we enjoyed taking our kayak on the river and paddling down river to Whitney. A climb to top of Hay Bluff at 677 metres, gave us a fantastic view of the verdant countryside. All in all a great weekend at 5* Baskerville Hall. Great to know you enjoyed your week with us Jonathan. The building is set in 130 acres of Welsh countryside overlooking the Wye Valley on the edge of the Brecon Beacons and Black mountain National Park. 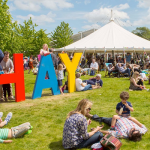 Hay on Wye, famous for its second hand book shops and Festival of Literature and Art, is just over a mile away nestled beside the river Wye. 27 en-suite rooms ranging from executive style splendour through standard rooms and budget rooms all with the trimmings you would expect, tea and coffee facilities in each room, colour TV and all rooms are en-suite. If creature comforts are not an integral part of your stay dormitory accommodation and camping are available.